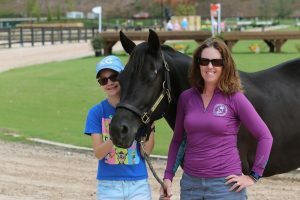 When Jen Garutti broke her hand earlier this year, she had a typical eventer’s response: ice it, wrap it up with vet wrap, take an extra ibuprofen, and get back in the saddle. The adult amateur from Flemington, NJ was competing her 15-year-old Connemara/Quarter Horse mare, Labras Leannon or “Anne”, at Flora Lea Horse Trials when she jammed her finger in the show jumping phase. She still rode cross country after the injury, then drove herself and her pony home. The next morning her hand was swollen and painful, but did Jen had other plans besides hanging around the ER that day. Initially she was told that she would need surgery: the top half of the bone split the bottom half of the bone and then the top was driven down into the bottom half of her finger. But upon advanced rider Clarissa Wilmerding’s recommendation, Jen found a great hand surgeon who was able to set the finger without surgery. Jen and her daughter, Devon. 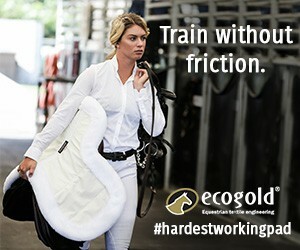 For the past two months she’s been cast-free and riding on her regular schedule in preparation for the American Eventing Championships (AEC) in Tryon, North Carolina. Last year at the AEC Jen and her pony claimed the Avery Dudasch Memorial Trophy, dedicated by Vicki Dudasch in memory of her 11-year-old daughter who died of cancer for the top-placing pony ridden by an adult in the Beginner Novice, Novice and Training Championships at the AEC. Garutti said that her daughter Devon, who also rides, was 11 last year, which made receiving the trophy even more poignant. But Jen’s broken finger was not the only obstacle the pair has overcome in their three years together. During the pre-purchase exam Anne tested positive for Lyme disease. Jen says that the sellers agreed to treat her for Lyme with doxycycline and Legend, then re-vetted her before Jen took her home on trial. A mother of two and District Commissioner of the Amwell Valley Hounds Pony Club, Jen also works full time as an IT Project Manager. She said that a flexible work schedule, with the ability to work from home two to three days a week, helps her balance riding with her already busy schedule. This year’s AEC is a family affair, with Jen’s mom and daughter both helping her out in the barn. “I’ve been part of the USEA since it was the USCTA, in the mid-80’s. I feel like they’re trying to recognize all the levels and give everyone their own ‘Olympic Experience’ of sorts,” she said. Just as her broken hand didn’t slow her down, Jen is focused on making this her best competition yet.